Between studying, homework and extracurricular activities, going back to school may make kids feel like they have the weight of the world on their shoulders. And sometimes, they literally do. After you pile a lunch, school supplies, binders and textbooks -- which typically weigh 3.5 lbs each -- into your child's backpack, the load he or she is lugging around could be huge ... and potentially dangerous. According to the U.S. Consumer Product Safety Commission, at least 14,000 children are treated for backpack-related injuries every year. It's easy to spot symptoms of a load that's too hefty for your child, adds Dr. Rob Danoff, an osteopathic family physician. If kids grunt when putting on or taking off the backpack, have red marks on their shoulders from the straps, or if they complain that their shoulders, arms or fingers are "falling asleep," those packs might just be too heavy. But don't fret, injury is preventable and it is possible for kids to carry backpacks comfortably. First thing's first: Dr. Elise G. Hewitt, president of the American Chiropractic Association’s (ACA) Pediatrics Council, recommends shopping at a sporting goods store because employees know how to fit backpacks. And though kids might object, Dr. Hewitt stresses the importance of using waist straps. "Shoulders are not designed to hang things from," Dr. Hewitt told The Huffington Post, pointing out the reason indigenous people carry things on their heads. By using the strap, the bulk of the weight can be carried on the hip bones, rather than on the shoulders. 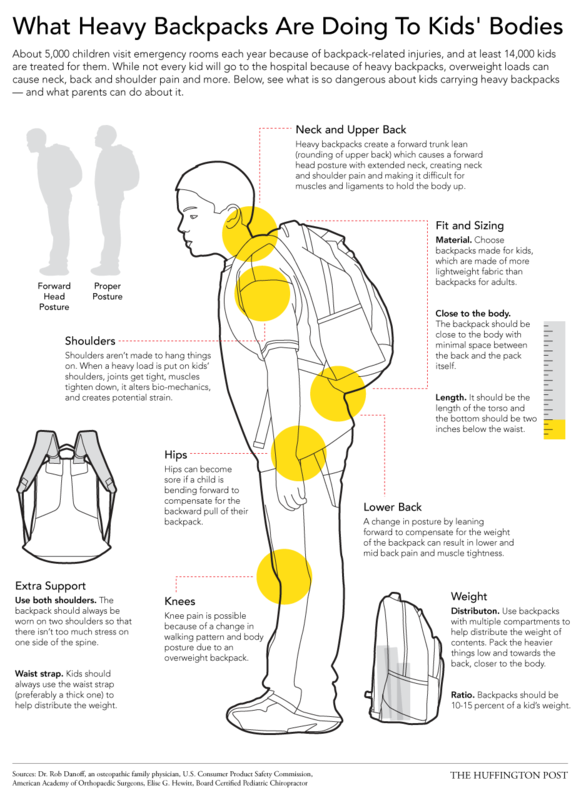 This infographic explains exactly what can happen to your kid's body from traveling with all of that extra weight on their backs -- and what can you can do about it. Check out our list of recommended backpacks here.